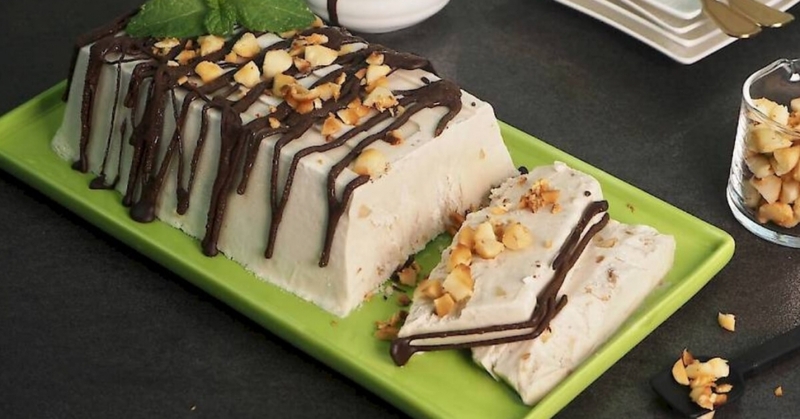 This delicious dairy free creamy, salted macadamia ice cream dessert will impress your guests with its full flavour and creaminess. In Italy they make their ice cream using olive oil and I know why – it’s so good! It’s a lovely light dessert to finish off a great meal but it’s hard to stop eating with its addictive salted macadamia flavour. I’ve given directions to make your ice cream in a blender so no one has an excuse to not make this yummy dessert but if you own an ice cream maker, skip the second blend and follow the manufacture’s directions. Add the macadamia nuts and olive oil to a high-speed blender. Start with variable speed and increasing to high for 10 seconds to break the nuts down, then scrape down the lid and sides of the jug. Add the banana, coconut cream, maple syrup, vanilla and salt to the blender. Blend on high for 25 seconds or until you reach a smooth and creamy consistency. Pour into a 21 x 10cm silicone loaf pan and place in the freezer for 2 hours or until half of the ice cream is frozen (I like to have all my ingredients in the fridge overnight and use frozen banana to reduce the first lot of freezing time). Meanwhile, heat a small fry pan on medium – low heat and add the ghee, chopped macadamias and salt. Lighty roast the nuts and then set aside to cool. Once the ice cream is frozen but the middle is still a little soft transfer back to the blender and blend again for 12 – 15 seconds. Add the salted roasted macadamia nuts to the ice cream and stir through by hand. Transfer back into the loaf pan and place back into the freezer to set for several hours or overnight. (Blending twice will give you a creamy texture otherwise the ice cream will have an icy texture. Ignore if using an ice cream maker). To serve, loosen the pan sides and pop the ice cream out onto a serving plate, the base will become the top. Gently melt the dark chocolate and drizzle over the ice cream. I like too also sprinkle some extra roasted nuts over the top. Use a large knife to slice through the ice cream (if the ice cream has been in the freezer for several days, allow to sit at room temperature for 15 – 20 minutes before slicing). NOTE: You can also leave the ice cream in the loaf pan (skip the decorating) and scoop out as needed from the freezer.